I just wanted take a moment to welcome my new readers (Hello! Please pour yourself a cup of tea and stay a while!) and to thank everyone who participated in my 30th Birthday Celebration this week. 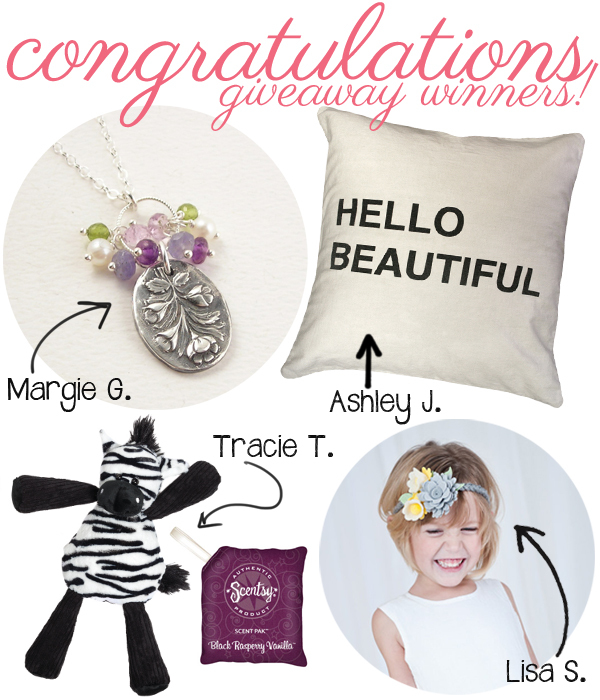 I especially want to thank our giveaway sponsors: Erin Elizabeth Jewelry, Sugarboo Designs, Ashley Lee for Scentsy, and Miss Ruby Sue. All really great companies and people to work with so please do yourself a favor and check them out! CONGRATULATIONS to our four winners!! I will be in touch via email for your mailing information to forward to our sponsors. Enjoy!! That's awesome! Thank you so much! Thank you so much! That was fun. I love your sponsors and enjoyed checking out their blogs! I plan to be a sponsor on your blog soon!